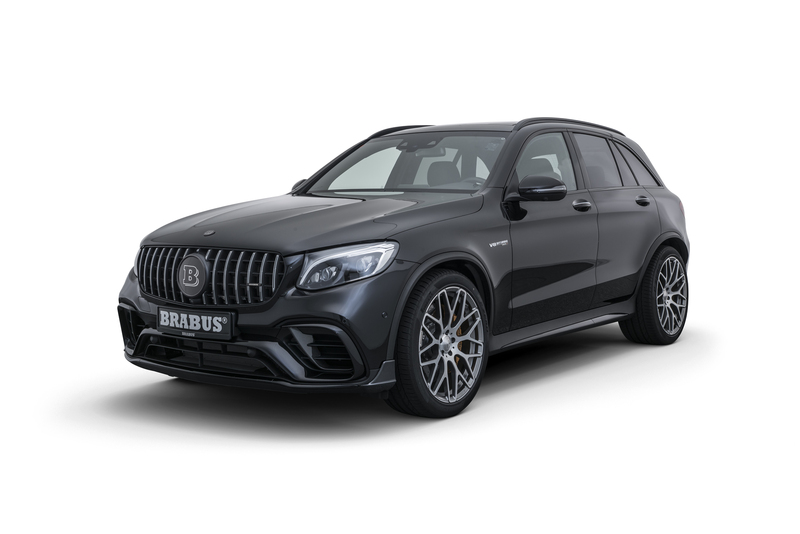 The new Mercedes GLC 63 S 4MATIC + has hit the showrooms and all versions, be it the SUV or Coupe, are the perfect basis for the engineers, technicians and designers of BRABUS to create a power-SUV in a class of its own. To this end, the four-liter eight-cylinder twin-turbo engine is enhanced with the BRABUS PowerXtra B40 600 performance upgrade. With an output of 441 kW / 600 hp (591 bhp) and a peak torque of 800 Nm (590 lb-ft), the five-door slings itself from rest to 100 km/h (62 mph) in just 3.6 seconds. The top speed is limited electronically to 300 km/h (186 mph). Naked-carbon aerodynamic-enhancement components with sporty-elegant styling and tailor-made BRABUS wheels with diameters from 19 to 22 inches lend the high-performance 4×4 fascinating looks. BRABUS offers a host of options for customizing the interior that range from sporty aluminum accessories to particularly exquisite BRABUS fine leather appointments crafted from the finest leather and Alcantara in any desired color. BRABUS PowerXtra B40 600 engine tuning makes the top-of-the-line model of the GLC series even more of a wolf in sheep’s clothing. 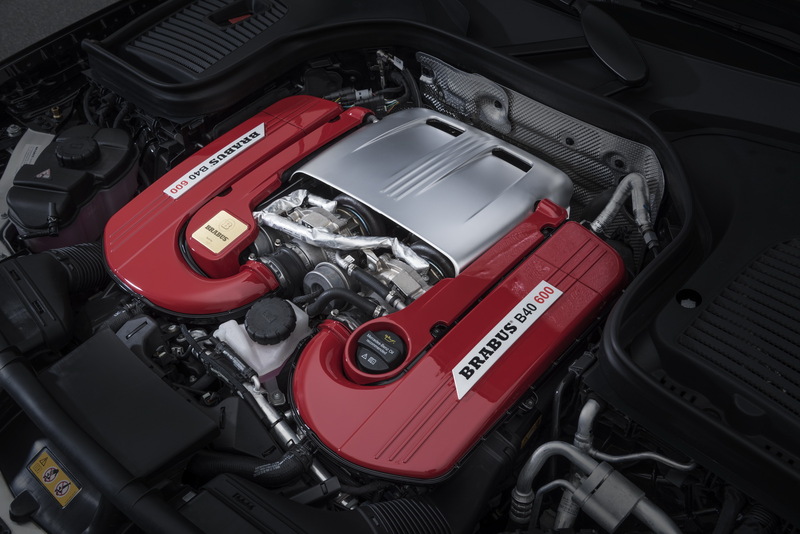 The BRABUS powerplant engineers used state-of-the-art test bench technology and extensive test drives on racetracks and on the road to develop a performance kit that boosts the power output of the turbocharged 4.0-liter V8 by 66 kW / 90 hp (89 bhp). A plug-and-play auxiliary control module is adapted to the electronic engine control unit, which introduces new mapping for injection and ignition while moderately increasing the boost pressure at the same time. As a result, the peak output jumps from stock 375 kW / 510 hp to 441 kW / 600 hp (591 to bhp) at a low 5,800 rpm. Peak torque simultaneously grows from 700 to 800 Nm (516 to 590 lb-ft), constantly on tap between 1,750 and 4,500 rpm. BRABUS recommends high-performance motor oil from technology partner MOTUL. 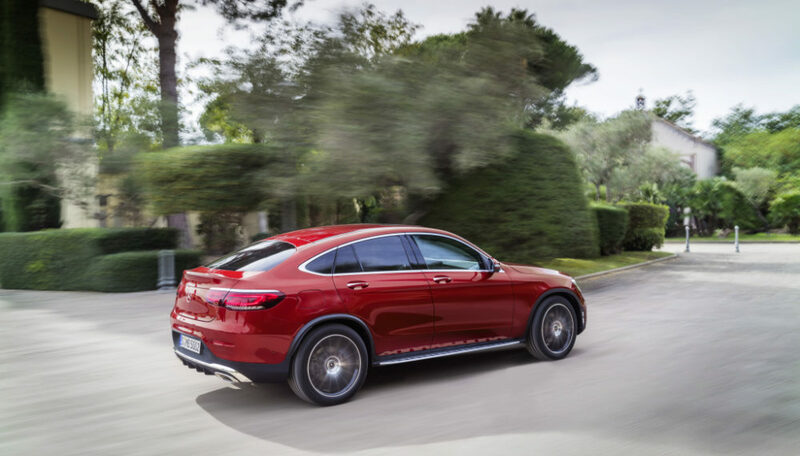 In harmonious concert with the nine-speed sports transmission, a GLC 63 S with BRABUS PowerXtra B40 600 performance upgrade accelerates from rest to 100 km/h (62 mph) in just 3.6 seconds. For ergonomically perfect manual gear changes, BRABUS offers the conversion of the production paddle shifters on the steering wheel to the BRABUS RACE aluminum components. The top speed of both body styles is electronically limited to 300 km/h (186 mph). 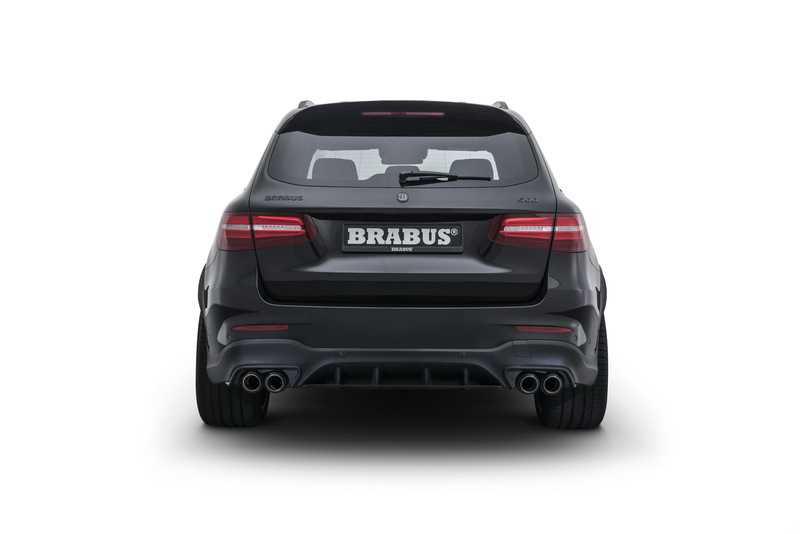 Sound and performance are the strong suits of the BRABUS sport exhaust, which fits both the GLC 63 S and the GLC 63. The stainless exhaust system reduces exhaust backpressure and features exhaust flaps for electronic control of the exhaust note. From the cockpit, the driver can choose between the discreet “Coming Home” mode and the open position of the exhaust flaps, which coax a decidedly powerful sound from the twin-turbo V8. In addition, the BRABUS exhaust is not just an absolute acoustic treat, but a visual one as well. 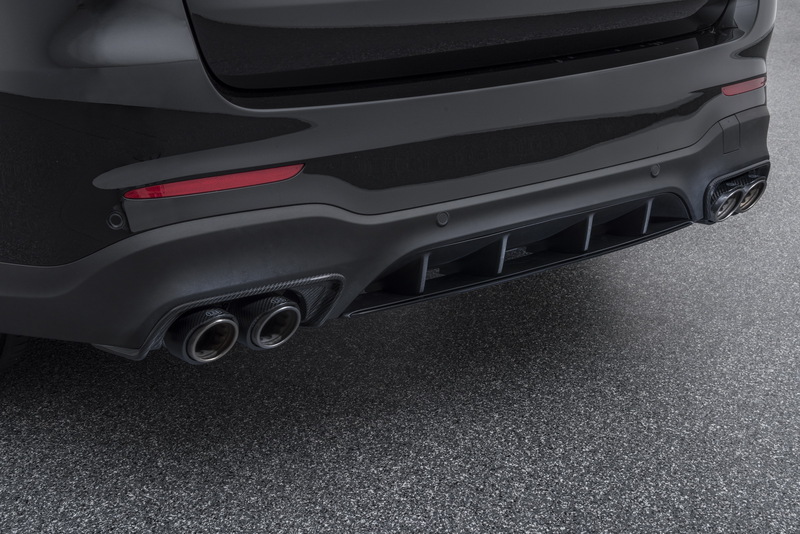 The four tailpipes, two on either side of the rear, are made from a combination of the two hi-tech materials titanium and carbon fiber, making them eye-catchers par excellence. Sporty looks and optimal aerodynamic function: The BRABUS designers developed bodywork components made from hi-tech carbon fiber that fit all GLC 63 variants. 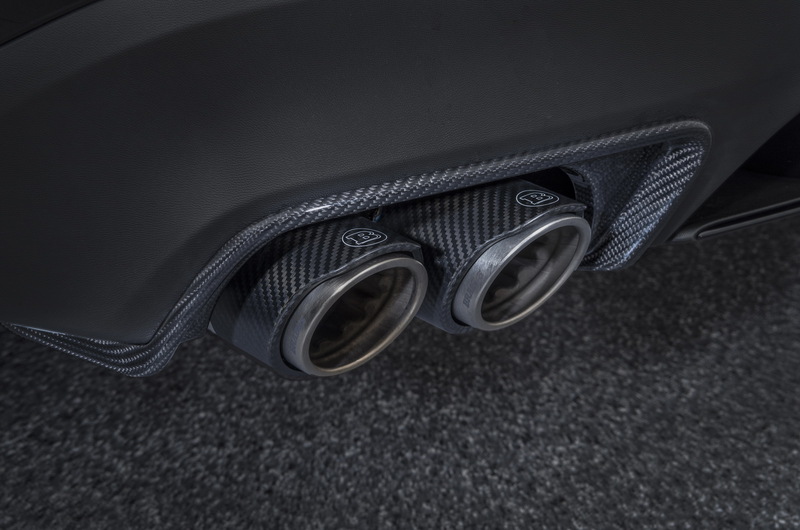 While the two naked-carbon surrounds that provide the perfect backdrop for the tailpipes of the BRABUS sport exhaust offer mainly visual benefits, the new BRABUS components for the front bumper also optimize the aerodynamics. 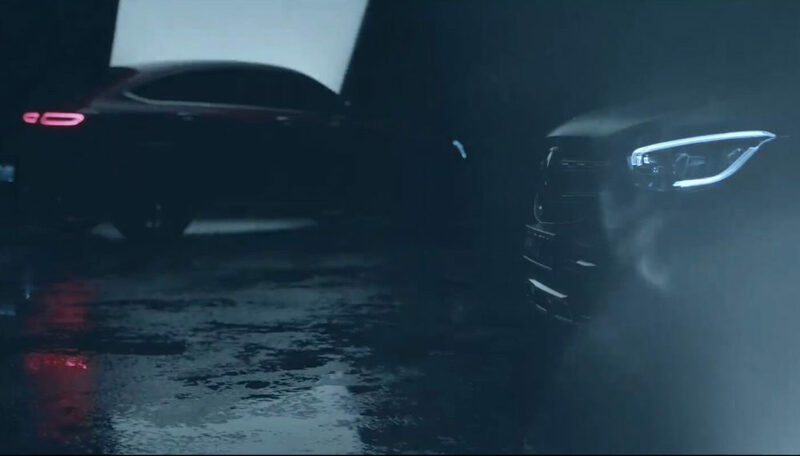 The raised flaps at the sides of the front fascia reduce front-axle lift at high speeds. Carbon surrounds for the side air intakes give the top-of-the-line GLC-Class an even more athletic appearance. Tailor-made BRABUS alloys for the GLC 63 are available in different designs with diameters ranging from 19 to 22 inches. The sportiest variant features various BRABUS Monoblock “PLATINUM EDITION” hi-tech forged wheels. Thanks to the use of state-of-the-art production technology, they offer an unrivalled combination of lightweight construction and maximum strength. 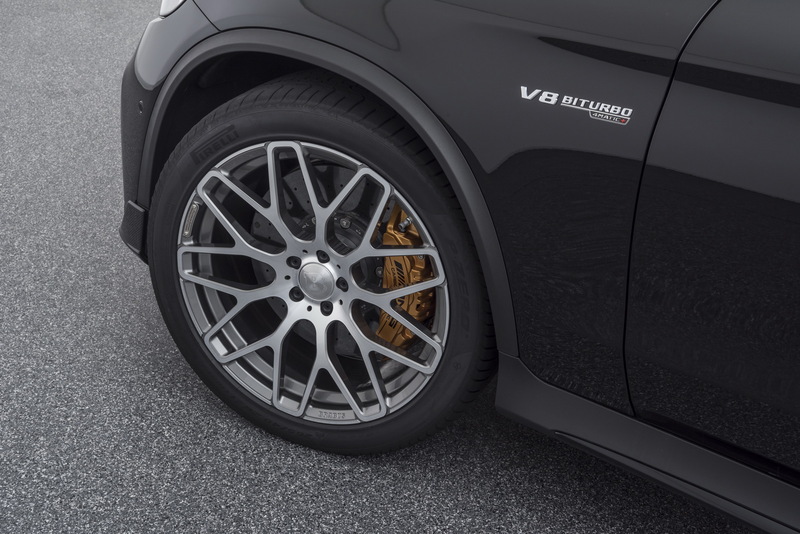 BRABUS technology partners Continental, Pirelli and YOKOHAMA supply the matching high-performance tires for the SUV. The vehicle pictured here is equipped with BRABUS Monoblock Y “PLATINUM EDITION” wheels. In line with the model designation, this design captivates with nine pairs of polished double-spokes, which extend all the way to the outer flange, where they nine times form a “Y.“ The forged wheels of size 9Jx21 at the front and 10.5Jx21 on the rear axle are mounted with high-performance street tires of sizes 265/40 ZR 21 and 295/35 ZR 21. The largest BRABUS variant for the GLC-Class features BRABUS Monoblock G “PLATINUM EDITION” forged wheels. These wheels are a maximum of ten inches wide and in combination with size 265/35 ZR 22 tires makes full use of the available space under the wheel arches. A special BRABUS control module for the AIRMATIC air suspension lowers the ride height of the high-performance SUV by about 30 millimeters (1.2 in). As a result, the 4×4 not only looks more exciting, but also delivers further improved driving dynamics thanks to the lower center of gravity. BRABUS has also been a world-renowned authority in the area of interior design for decades. For the GLC-Class, the company upholstery shop creates BRABUS fine leather appointments tailored to customer preferences in every detail. The finest BRABUS Mastik leather, an especially soft and breathable type of leather, and Alcantara are transformed with precision workmanship into high-quality interiors in any desired color by hand. The transformation includes the dashboard, seats, door panels and headliner. The BRABUS interior precious-wood and carbon-fiber trim sets likewise offer maximum variety in terms of colors and surface finishes. The product lineup is rounded off by an extensive selection of custom accessories for the cockpit. 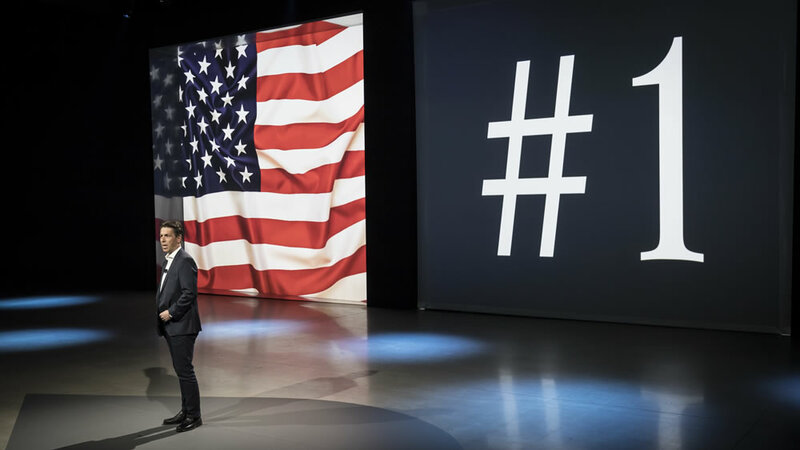 It ranges from aluminum door-lock pins and pedals to stainless scuff plates with backlit BRABUS logo changing colors in sync with the interior ambience lighting. The BRABUS 600 Compact SUV can be ordered as a complete car with SUV or coupe body style. Alternatively, any GLC 63 S can be transformed to this specification all at once or in stages. BRABUS 600 Compact SUV based on the Mercedes GLC 63 S 4MATIC+: city 14.8 l / 100 km, highway 10.2 l / 100 km, combined: 11.9 l / 100 km. Combined CO2 emissions: 270 g/km, efficiency class G.